McDonald's has been making headlines lately, but for all the wrong reasons, sparking speculation that the golden years of the golden arches are over. Food industry analysts don't think McDonald's will go the way of the Woolworth's lunch counter, but one of the most recognizable brands in the world, with 36,000 locations globally and 1,400 in Canada, is in decline and scrambling for a new strategy under new leadership. "The biggest challenge McDonald's faces is remaining relevant as a generational retailer," said Canadian retail executive George Minakakis. McDonald's warned in January that business would be weak in the first half of 2015 and said it would cut its annual construction budget to the lowest in more than five years as it opens fewer restaurants in struggling markets like the U.S., Japan and Australia. The company is scaling back openings in emerging markets like China and Russia, too. The burger giant reported a 21 per cent drop in fourth-quarter earnings, faced a food-safety scandal in China and named a new CEO in January, tasked with finding a strategy to regain momentum. Don Thompson, who took the global helm in July 2012, is being succeeded by chief brand officer Steve Easterbrook on March 1. The chain's problems are not as simple as a shift in food tastes and heightened health consciousness. Shares in the fast-casual burger-and-fry chain Shake Shack, David to McDonald's Goliath, more than doubled in its first day of trading in January, in a pointed contrast with the lacklustre performance of McDonald's, whose shares are down 1.3 per cent over the past year. The buzzword "millennials" is thrown around by analysts as a segment of consumers that can't be ignored. Younger restaurant goers tend to prefer customization over standardization. Restaurants like Chipotle and the Freshii franchise in Canada let diners build their meal and customize orders, while promising fresher ingredients. "There's been a shift in consumer preferences," said R.J. Hottovy, a restaurant analyst at investment management firm Morningstar. "People have moved towards healthier, fast-casual places like Chipotle and Panera." Thompson started to roll out a customized "Create Your Taste" menu, but orders could take five to seven minutes, compared with just a couple of minutes for regular items, and it was panned by franchisees across the board. While Thompson said the plan would allow McDonald's to become more like Chipotle and Subway by letting customers select sandwich toppings, Richard Adams, a former McDonald's franchisee who now consults current ones, said the reaction by franchisees has been "A chorus of No's." The answer isn't in copying the customized meal approach of competitors, but by reducing the number of menu items and doing them better, franchise owners say. "There's a younger consumer, but they eat burgers," said Howard Penney, managing director and restaurant analyst at Hedgeye Risk Management. "I don't think they have a millennial problem, they have a food problem." Struggling franchise owners are encouraging corporate to innovate by going back to basics. 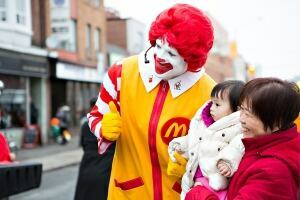 More than 80 per cent of McDonald's restaurants are owned by entrepreneurs, individuals and families. In the '60s, '70s and '80s if you could round up the capital to open a McDonald's franchise it was a licence to print money, according to CBC business commentator Michael Hlinka. But today, while margins may be reasonable at McDonald's Corporate, franchisees operate restaurants with margins rarely exceeding three per cent, said Sylvain Charlebois, a professor of food distribution and policy at University of Guelph. "Even operators who own more than one outlet struggle to increase margins due to mounting royalty fees," he said. In interviews, franchisees and advisers to restaurant owners say they hope new CEO Easterbrook will shrink McDonald's growing menu to concentrate on burgers and fries. While most franchisees are reluctant to speak to the press, they offered blunt recommendations in a survey published in January by Janney Capital Markets analyst Mark Kalinowski. Change is "moving too slow, let's bite the bullet," one survey respondent said. They suggested dropping McCafe espresso drinks, which critics say don't sell enough to pay for the electricity used by the machines that make them. They also want to cut the number of Happy Meal options and get rid of the hard-to-make McWraps and other poorly performing menu items. "They need to commit to a more streamlined menu — reducing the menu options — fewer but more impactful items," said Hottovy. This isn't the first time McDonald's has faced pressures like this. "In 2002 and 2003 you'd be asking the exact same questions: Is it broken? Is it forever gone? Someone will figure it out. Someone will get the brand to a place that changes consumers' perception," said Penney. 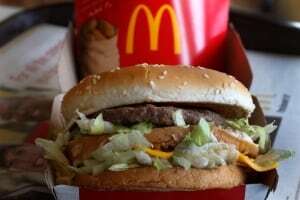 In 2002, McDonald's was losing market share and shares were in serious decline. The company managed to implement a strategy that turned it around. But, the environment is different now. "This might not be the worst they've ever faced, but the blueprint for recovery isn't what it was," said Hottovy. Minakakis thinks the chain needs to target a wider segment of the population. "Simply an increase in traffic is key to long-term success," he said. The Shake Shack model is one that is working to attract a wide, and younger, crowd. Older fast food chains advertise on TV while Shake Shack has taken to social media, according to a report by Goldman Sachs. The company is appealing to a younger customer base and developing a strong following online. It has far more followers on Instagram relative to its size than McDonald's, Taco Bell and KFC. The burger chain markets cheaply via social media, and while it only operates around 70 locations worldwide, as the company grows and opens more locations, the demand is already there. On mobile? See the tweet here. But the veterans aren't going anywhere. "McDonald's will definitely come back. The question is, when? And who's going to do it?" said Penney. "The new CEO's got some work to do to change the perception of the food or the quality of the food. "We don't know yet what that plan is or what his time frame is."